We knew we had hard water upon moving into our house 3 years ago. The thing that really annoys me is how quickly our shower goes from pristine to rusty looking. I have had to replace so much caulking in there I might as well take on side jobs in the caulking business. Our son has never liked water getting in his eyes in the tub or shower. He always would say that it burned, but we always use tear free soaps. After our daughter was born I had noticed a few times where she would get this, sort of, red rash on her face during bath time. Her eyes would turn red and it just looked terrible. My first thought was it was her soap, but it didn’t happen during every bath. Plus, we tried different soaps and that didn’t make a difference. In the last month this shower situation has really been getting on my nerves. I scrub it to death, but it doesn’t last but a week or so before it looks rusty again. So then it occurred to me, what if the water IS the culprit and poor pickle had been suffering through bath time all along? So I Google to find out if there is something you can use to filter water on the shower or tub. Why YES there is! I ordered one for our shower and we just started using it about a week ago. I am curious to see if it helps keep the rust at bay. So then I got to thinking, if this is happening in our shower what happens to us when we are drinking the tap water from the sink? 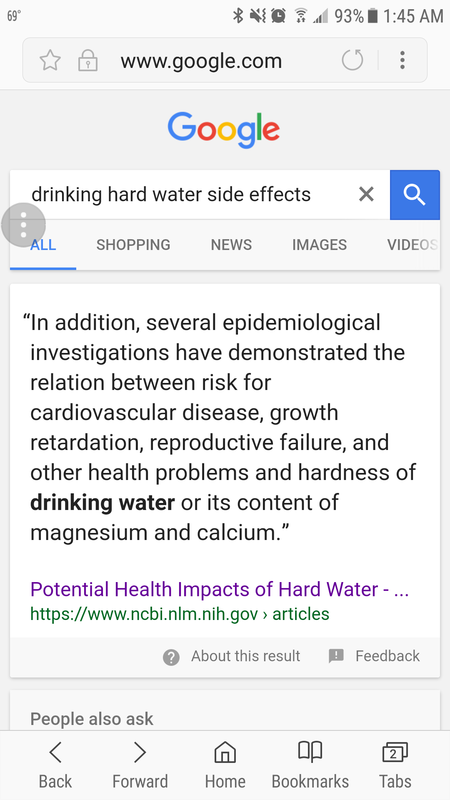 According to this, there are some serious ramifications in drinking hard water. The next thing to find out though is it a certain level of hardness or is all hardness bad? I suppose we will need to test our water again to find out. I think I am going to get the under the sink filtration system or maybe just a faucet filter will work. I would rather use the environmentally friendly option rather than buying and throwing away a ton of plastic bottles. Ah, the choices! I also need to find a solution for the bath tub still. I guess there are some more changes we need to make around here with our water situation! Perhaps tomorrow. I was super gobbsmacked at what I read. I noticed sometimes my hair does get tangly but its healthy bc I use really good products for my hair. You are telling me! Everything causes cancer anymore! Are we ever really safe? I had read somewhere awhile back that the little red bumps I get in my arm can also be attributed to hard water! I am curious to see how long it takes for me to see a change in that, if I do. I have tried several Pinterest recipes, but nothing worked thus far. Here’s to hoping!! I have extremely thick curly coarse hair so it is always tangled it would be difficult for me to decipher between normal tangled and hard water tangles lol. I know! Don’t do this, you’ll get cancer. Don’t do that, you’ll get cancer. Blah, blah. That’s what I ask myself, are we safe? I have red bumps on the back of my arms + google tells me that its from excessive amount of gluten (I have gluten issues). Google how to get rid of it, its called Keratosis.